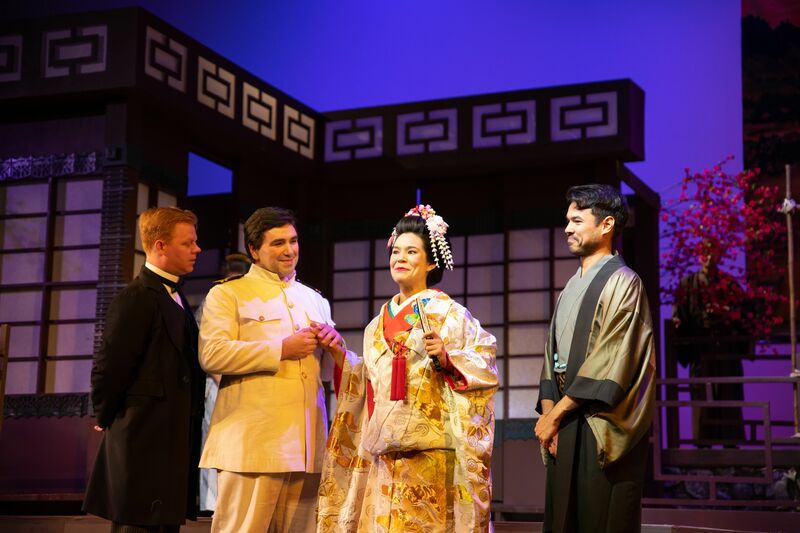 Pacific Opera Project’s new staging of Madama Butterfly, a co-production with Houston’s Opera in the Heights, is in the middle of a sold out run at Little Tokyo’s Aratani Theatre. If you missed last weeks premier and don’t have tickets for either of the remaining shows you still have a chance to experience POP’s unique and powerful interpretation; The matinee performance on Sunday, April 14th, will be livestreamed at the company’s Facebook page. The opera sounds and looks great, as we have come to expect from POP–the singers excel musically and dramatically, the orchestra is on point, the sets and costumes attractive and well considered. But where previous production like the Nintendo inspired Magic Flute or the company’s signature interpretation of La Boheme, AKA The Hipsters reveled in the kind of pop elements suggested in the company’s acronym, this Butterfly plays it as straight as possible. The production features a new English and Japanese translation of the libretto, clarifying much of the action and providing a new level of realism to Puccini’s tragic masterwork, as POP director Josh Shaw intended. Peter Lake’s clear, clean tenor renders the American naval officer Pinkerton as the consummate Ugly American. A production in Italian can sometimes convey some ambiguity, particularly in the romantic duet that closes the first act. Does Pinkerton ever fall for Cho-Cho-san, his Buterfly, even for a moment, or is his intent purely selfish at all times? The English translation removes any plausible deniability of his callousness and base intent. In Italian, they are in unison; singing English and Japanese to one another, they are singing past each other, Butterfly idealizing the officer, Pinkerton indifferent to the feelings of a girl he does not consider as an equal. Cho-Cho-san was wonderfully sung on opening night by Janet Todd, radiating the innocent nature of the ill-fated geisha and masterfully hitting all the notes despite being the role’s second. The set, recreating a home overlooking Nagasaki Harbor, is rich in detail and color. Among the most affecting of the various artifacts is the American flag that Butterfly hangs in the house to symbolize her feeling of becoming an American by marriage to Pinkerton; though the action takes place at the turn of the 20th century, that this sense of Americanism is among the promises betrayed by Pinkerton could hardly feel more relevant today. Remaining performances are Saturday April 13 7:00 pm and Sunday April 14 2:00 pm; Sunday’s performance will be streamed, live on Facebook. At the Aratani Theatre, 244 San Pedro Street, Los Angeles, CA 90012. Tickets $15-75, sold out as of this writing. For more information, visit Pacific Opera Project on the web. This entry was posted in Events, Miscellanious, Music, Theater, Upcoming Events, Videos. Bookmark the permalink.